Nickelodeon Kart Racers is a multi-player console racing game that features iconic Nickelodeon animated characters from SpongeBob SquarePants, Teenage Mutant Ninja Turtles, Rugrats, Hey Arnold! and more as they race on 24 different Slime-themed tracks. 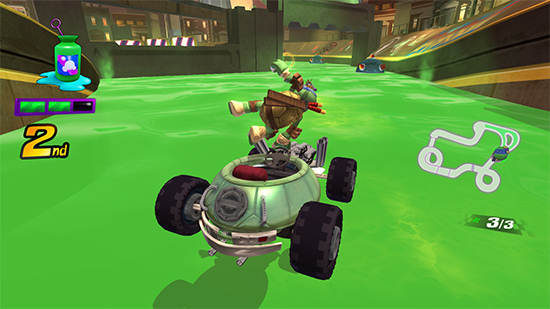 Players can compete as their favorite Nick character in four-player local multiplayer or battle mode to win cups and Kart upgrades; all while getting Slimed! GameMill Entertainment today announced that Nickelodeon Kart Racers has gone gold and is now in manufacturing. The game will launch in the US on October 23 and on October 26 in EMEA for £29.99 €39.99 for PlayStation 4, Xbox One and Nintendo Switch and is available now for pre-order. The title is rated PEGI 3.